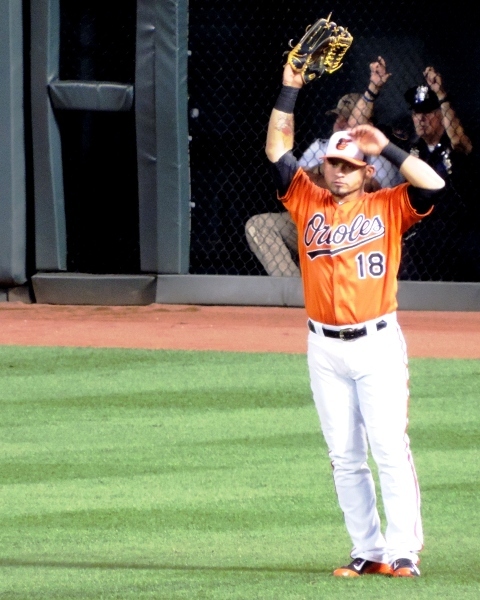 This entry was posted in Baltimore Orioles and tagged Egg Salad, Gerardo Parra, Oakland A's, photography, Salad Days, Shakespeare by Jackie, The Baseball Bloggess. Bookmark the permalink. Great post, as usual. Hey, you take some awesome photos. What camera and lenses are you using? Thanks for stopping by Greg. When I’m shooting at UVa games or smaller games where I can move about then I use a Nikon 5200, usually with a Nikkor 55-300mm, f 4.5/5.6 lens. Nothing fancy. It works well, but isn’t my dream lens. 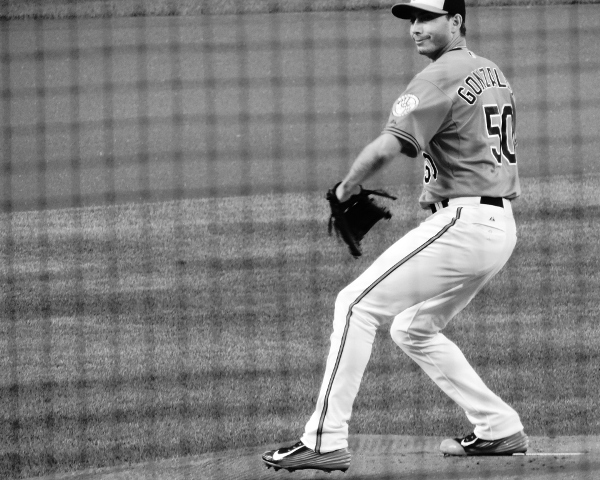 But, when I go to Orioles games, when I’ll be a bit far from the action (even with good seats), and I have far less ability to move around, and don’t want to have my camera doused in someone’s Natty Boh, I’ll happily revert to my Nikon P-520 with its super zoom lens. A lot of good photographers will wrinkle their nose at a point-and-shoot … but it’s pretty versatile. And, there are nice manual controls. The aperture is terrible for all but macro shots, but the shutter control allows you a good bit of flexibility. 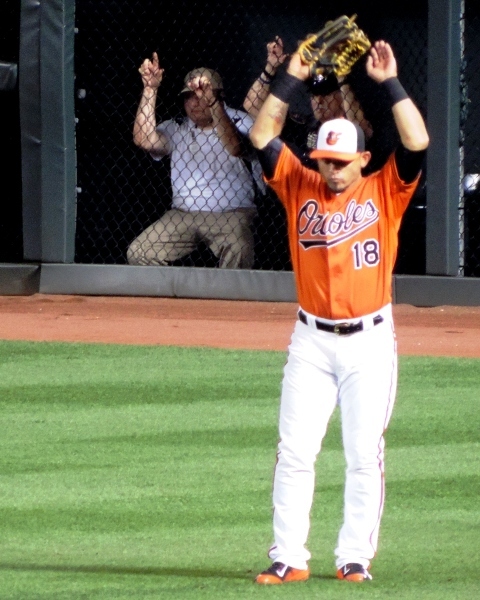 Not the best for capturing the shot of a lifetime, but if you just want to prove to your friends that Gerardo Parra was doing the Wave with the fans out in right field … it does the job right well. Wow, just goes to show you it’s the photographer and and the camera! I have the same lens (on a Canon) plus some other shorter lenses, but yours are better. I looked up the specs on your Nikon and that’s an amazing zoom. Like you, the zoom is not my dream lens but I can’t justify dropping $2k or more to upgrade. But the Nikon sounds like a fantastic alternative! That’s a great little camera! Sorry I meant to say “and NOT the camera!” I am distracted by Car Talk this morning. The P520 is several years old, so their newer models are even more robust — some are even zoomier — and get great overall reviews. Again, you’ll never match it against a true DSLR, but it does the trick. The new P900 looks really good and has an 83x optical zoom. No RAW options on these models, and while the photos are fine for blogs and the internet, you can tell the difference when you print them out if you’re fussy about things. That said, I continue to learn ways to tweak the P520 to improve the photo quality. Thanks for your kind words … I have really tried to capture the essence of the players and the fans when I’m at a game. Of course, for every good shot, there are at least 20 lousy ones. And, usually one dumb luck one. 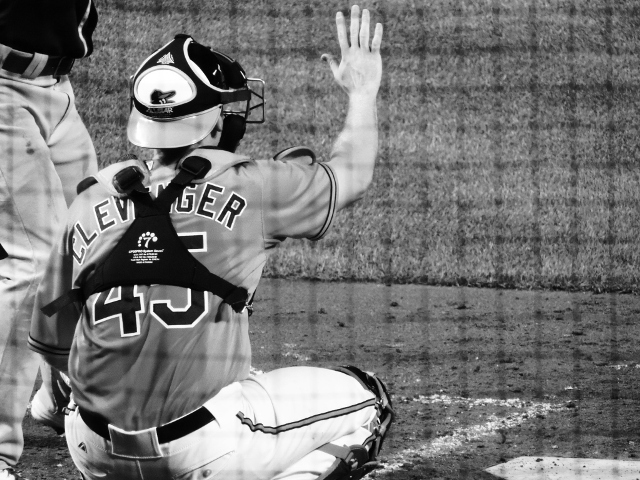 I like the way you use photos to tell the story of your visits to ballparks. Fortunately, in the digital world we can shoot all day, can’t we … and not spend a penny on film! A couple of great tailgating treats I’ve sampled: Pickled asparagus (which you’ve undoubtedly sampled or made, and smoked deviled eggs. 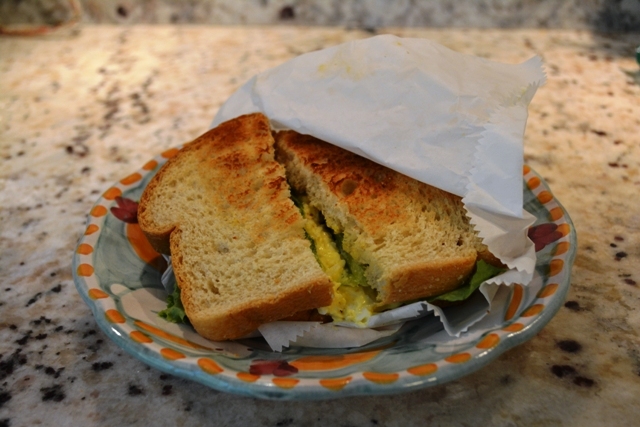 Egg salad needs a pickle, that touch of dill. 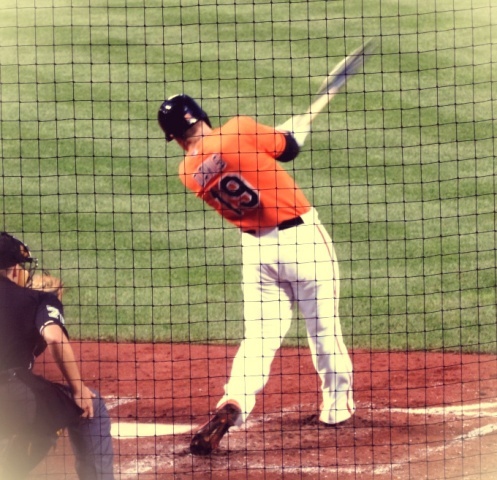 We’ll see how the Os do these next three games vs. the Twins; Duffy has a filthy curve ball. As they say, you are one in a million! Awww … Gloria, you’re the bee’s knees! Egg salad is good. Chicken salad, good. Tuna salad, okay. Potato salad, awesome. Salad salad… I can take it or leave it. And, then there are the awful salads … Waldorf and Jell-O and Aspic (the savory Jell-O) … well, really any salad that requires a mold or miniature marshmallows or a can of fruit cocktail. You’re right. Potato Salad is the winner.